Throughout history, many versions of the Tripitaka have existed, containing different texts. However, the oldest and most widely-known version is the Pāli Canon of the Theravāda school described below. 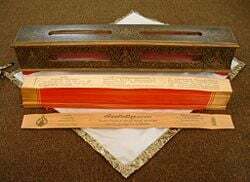 The Pali Canon is the standard scripture collection of the Theravada Buddhist tradition, as preserved in the Pali language. The Canon was written down from oral tradition at the occasion of the Fourth Buddhist Council (in the usual Theravada numbering), first century B.C.E., in Sri Lanka on ola (palm) leaves. Passed down to other Theravadin countries, this Ceylonese Canon is the most complete surviving early Buddhist canon and one of the first to be written down. The Pali Canon falls into three general categories, called pitaka (piṭaka, basket) in Pali: The first category, the Vinaya Piṭaka, was the code of ethics to be obeyed by the early saṅgha, monks and nuns. According to the scriptural account, these were invented on a day-to-day basis as the Buddha (c. 563 B.C.E. to 483 B.C.E.) encountered various behavior problems with the monks. The second category, the Sūtra Piṭaka (literally "basket of threads," Pāli: Sutta Piṭaka), consists primarily of accounts of the Buddha's teachings. The Sūtra Piṭaka has numerous subdivisions: it contains more than 10,000 sūtras. The third category is the Abhidharma Piṭaka. This is applied to very different collections in different versions of the Tripiṭaka. In the Pāli Canon of the Theravāda there is an Abhidhamma Piṭaka consisting of seven books. An Abhidharma Piṭaka of the Sarvāstivāda school survives, also in seven books, six in Chinese and one in Tibetan. These are different books from the Pali ones though there are some common material and ideas. Another work surviving in Chinese, the Śāriputrābhidharmaśāstra, may be all or part of another Abhidharma Piṭaka. At least some other early schools of Buddhism had Abhidharma Piṭakas, which are now lost. The first category, the Vinaya Pitaka, is mostly concerned with the rules of the sangha, both monks and nuns. The rules are preceded by stories telling how the Buddha came to lay them down, and followed by explanations and analysis. According to the stories, the rules were devised on an ad hoc basis as the Buddha encountered various behavioral problems or disputes among his followers. This pitaka can be divided into three parts. Suttavibhanga (-vibhaṅga) Commentary on the Patimokkha, a basic code of rules for monks and nuns that is not as such included in the Canon. The monks' rules are dealt with first, followed by those of the nuns' rules not already covered. Khandhaka Other rules grouped by topic in 22 chapters. Parivara (parivāra) Analysis of the rules from various points of view. The second category is the Sutta Pitaka (literally "basket of threads," or of "the well spoken"; Sanskrit: Sutra Pitaka, following the former meaning) which consists primarily of accounts of the Buddha's teachings. The Sutta Pitaka has five subdivisions or nikayas. Digha Nikaya (dīghanikāya) 34 long discourses. Joy Manné argues that this book was particularly intended to make converts, with its high proportion of debates and devotional material. Majjhima Nikaya 152 medium-length discourses. Manné argues that this book was particularly intended to give a solid grounding in the teaching to converts, with a high proportion of sermons and consultations. Samyutta Nikaya (saṃyutta-) Thousands of short discourses in 50-odd groups by subject, person, etc. Bhikkhu Bodhi, in his translation, says this nikaya has the most detailed explanations of doctrine. Anguttara Nikaya (aṅguttara-) Thousands of short discourses arranged numerically from ones to elevens. It contains more elementary teaching for ordinary people than the preceding three. Khuddaka Nikaya A miscellaneous collection of works in prose or verse. See below. The contents of this nikaya vary somewhat between different editions of the Canon. The "standard" list, given in most Western sources, contains the following. Khuddakapatha (-pāṭha) Nine short texts in prose or verse. This seems to have been intended as an introductory handbook for novices. Most of its contents are found elsewhere in the Canon. Dhammapada 423 verses ascribed by tradition to the Buddha in 26 chapters by topic. About half the Pali verses are found elsewhere in the canon. In the Sinhalese tradition, monks have been required to know this book by heart before they can be ordained. In the Burmese examination system, this is one of the texts to be studied in the first stage of the syllabus. Udana (udāna) 80 short passages, mostly verse, ascribed to the Buddha, with introductory stories. Itivuttaka 112 short prose teachings ascribed to the Buddha followed by verse paraphrases or complements. These are arranged numerically, from ones to fours. Suttanipata(-nipāta) Poems, some in prose frameworks. In five parts, of which the first four contain 54 poems. The fifth part is a single poem in 16 sections, plus an introduction and a conclusion, which last includes a little prose. Vimanavatthu (vimāna-) 85 poems telling of celestial mansions resulting from good karma. Petavatthu 51 poems telling of the suffering of ghosts resulting from bad karma. It gives prominence to the idea that gifts to monks can benefit one's deceased relatives' ghosts. Theragatha(-gāthā) 264 poems ascribed to early monks, arranged roughly by increasing number of verses. Therigatha (therī-) 73 poems ascribed to early nuns, arranged by increasing number of verses. Jataka Tales (jātaka) 547 poems said to relate to the Buddha's previous lives, arranged roughly by increasing number of verses. Professor Oskar von Hinüber says only the last 50 were intended to be intelligible on their own without the Commentary. As a result of the arrangement, these make up the greater part of the book. Niddesa Commentary on parts of Suttanipata: the last two parts and one other sutta. Traditionally ascribed to the Buddha's disciple Sariputta. Patisambhidamagga (paṭisambhidā-) 30 treatises on various topics. Traditionally ascribed to Sariputta. Gethin says this book presents the awakening experience as having many different dimensions and aspects, related to the whole of the teaching, and yet as a simple, coherent whole. Apadana (apadāna) About 600 poems, most telling how their authors performed a meritorious act in a distant past life, resulting in favorable rebirths and eventual nirvana. There are 589 in the Pali Text Society's edition; 603 in the Sixth Council edition; and 592 in a number of others. Buddhavamsa (-vaṃsa) Short verse book, mainly telling of the previous 24 Buddhas and the current Buddha's meritorious acts towards them in his previous lives. Cariyapitaka (cariyā-) 35 poems telling of Gotama Buddha's practice of seven of the perfections in his previous lives. However, some editions contain in addition some works that have been described by Western scholars as paracanonical or semicanonical. The following works are included in the Sixth Council edition of the Canon, including the new transcript from Thailand. Nettipakarana (nettipakaraṇa, nettippakaraṇa or just "netti") This book presents methods of interpretation. The colophon ascribes it to the Buddha's disciple Kaccana. Petakopadesa (peṭakopadesa) Presents the same methods as the preceding book. They have a large amount of overlap. The text of this book is very corrupt. The colophon ascribes it to the Buddha's disciple Kaccana. Milindapanha (-pañha or -pañhā) A dialogue between King Menander of Bactria (second century B.C.E.) and the monk Nagasena. The first two of these, but not the third, are included in the Sinhalese (printed) edition. All are omitted from the Thai edition. Inclusion in printed editions is not the same as canonicity (cf. Apocrypha). Professor George Bond of Northwestern University says of the first of these books that some Theravadins regard it as quasi-canonical, others as canonical, especially in Burma. About 1800, the head of the Burmese sangha regarded at least the first two of these books as canonical. On the other hand, at least one recent Burmese teacher has not. The third category, the Abhidhamma Pitaka (literally "beyond the dhamma," "higher dhamma" or "special dhamma," Sanskrit: Abhidharma Pitaka), is a collection of texts that give a systematic philosophical description of the nature of mind, matter and time. There are seven books in the Abhidhamma Pitaka. The traditional position is that the Abhidhamma is the absolute teaching, while the suttas are adapted to the hearer. Most scholars describe the abhidhamma as an attempt to systematize the teachings of the suttas: Harvey, Gethin. Cousins says that where the suttas think in terms of sequences or processes the abhidhamma thinks in terms of specific events or occasions. According to the scriptures a council was held shortly after the Buddha's passing to collect and preserve his teachings. It is traditionally believed by Theravadins that most of the Pali Canon was recited orally from this time, with only a few later additions. There are wide differences of opinion among scholars regarding to what extent the teachings may be traced to the historical Buddha himself. Dr. Richard Gombrich, Academic Director of the Oxford Centre for Buddhist Studies, former Boden Professor of Sanskrit at the University of Oxford and former President of the Pali Text Society, argues that the content, as opposed to the form, of large parts of the Canon goes back to the Buddha himself. At the other end of the debate, Dr. Gregory Schopen, Professor of Sanskrit, Tibetan, and Buddhist Studies at the University of Texas at Austin, argues that it is not until the fifth to sixth centuries C.E. that we can know anything definite about the contents of the Canon. Other scholars hold various positions in this range. Likewise, different positions have been taken regarding what are the earliest books of the Canon. The majority of Western scholars consider the earliest identifiable stratum to be mainly prose works, the Vinaya (excluding the Parivara) and the first four nikayas of the Sutta,, and perhaps also some short verse works  such as the Suttanipata. However, some scholars, particularly in Japan, maintain that the Suttanipata is the earliest of all Buddhist scriptures, followed by the Itivuttaka and Udana. Most of the above scholars would probably agree that the early books include some later additions. On the other hand, some scholars have claimed that central aspects of later works are or may be much earlier. According to the Sinhalese chronicles, the Pali Canon was written down in the reign of King Vattagamini (Vaṭṭagāmiṇi) (first century B.C.E.) in Sri Lanka, at the Fourth Buddhist council. Most scholars hold that little if anything was added to the Canon after this, though Schopen questions this. Dr. Rupert Gethin says that the whole of Buddhist history may be regarded as a working out of the implications of the early scriptures. The Canon is traditionally described by the Theravada as the Word of the Buddha (Buddhavacana), though this is obviously not intended in a literal sense, since it includes teachings by his disciples. The traditional interpretation is given in a series of commentaries covering nearly the whole Canon, compiled by Buddhaghosa (fourth or fifth century C.E.) and his followers, mainly on the basis of earlier materials now lost, subcommentaries on most of these and sometimes even further layers. It is summarized in Buddhaghosa's Visuddhimagga. An official view is given by a spokesman for the Buddha Sasana Council of Burma: the Canon contains everything needed to show the path to nirvana; the commentaries and subcommentaries sometimes include much speculative matter, but are faithful to its teachings and often give very illuminating illustrations. In Sri Lanka and Thailand, "official" Buddhism has in large part adopted the interpretations of Western scholars. Although the Canon has existed in written form for two millennia, its oral nature has not been forgotten in actual Buddhist practice within the tradition: memorization and recitation remain common. A standard collection of frequently recited texts is the Paritta or Catubhanavara. Even lay people usually know at least a few short texts by heart and recite them regularly; this is considered a form of meditation, at least if one understands the meaning. Monks are of course expected to know quite a bit more (see Dhammapada below for an example). A Burmese monk named Vicittasara even learnt the entire Canon by heart for the Sixth Council (again according to the usual Theravada numbering). Recitation is in Pali as the ritual language. The climate of Theravada countries is not conducive to the survival of manuscripts. Apart from brief quotations in inscriptions and a two-page fragment from the eighth or ninth century found in Nepal, the oldest known manuscripts are from late in the fifteenth century, and there is not very much from before the eighteenth. The first complete printed edition of the Canon was published in Burma in 1900, in 38 volumes. The following editions of the Pali text of the Canon are readily available in the West. No one edition has all the best readings, and scholars must compare different editions. In the diverse schools of Mahayana Buddhism, a mixed attitude to the Tripiṭaka developed. On the one hand, a major Mahāyāna scripture, the Lotus Sutra, uses the term to refer to the above literature of the early schools, as distinct from the Mahāyāna's own scriptures, and this usage became quite common in the tradition. On the other hand, the term Tripiṭaka had tended to become synonymous with Buddhist scriptures, and thus continued to be used for the Chinese and Tibetan collections, even though their contents did not really fit the pattern of three piṭakas. In the Chinese tradition, the scriptures are classified in a variety of ways, most of which have in fact four or even more piṭakas or other divisions. In the few that attempt to follow a genuine threefold division, the term Abhidharma Pitaka is used to refer vaguely to non-canonical literature, whether Indian or Chinese, with only the other two piṭakas being regarded as strictly canonical. In the Tibetan tradition, on the other hand, when attempts are made to explain the application of the term Tripiṭaka to the Kanjur, the Tibetan canon of scripture, the Abhidharma Piṭaka is considered as consisting of the Prajñāpāramitā. The Chinese form of Tripiṭaka, "Sanzang" (三藏), was sometimes used as an honorary title for a Buddhist monk who has mastered all the Tripiṭaka canons, most notably in the case of the Tang Dynasty monk Xuanzang, whose pilgrimage to India to study and bring Buddhist texts back to China was portrayed in the novel Journey to the West as "Tang Sanzang." Due to the popularity of the novel, the term in "Sanzang" is often erroneously understood as a name of the monk Xuanzang. The other two main canons in use at the present day are the Tibetan Kangyur and the Chinese Buddhist Canon. The former is in about a hundred volumes and includes versions of the Vinaya Pitaka and the Dhammapada (the latter confusingly called Udanavarga) and of parts of some other books. The standard modern edition of the latter is the Taisho published in Japan, which is in a hundred much larger volumes. It includes both canonical and non-canonical (including Chinese and Japanese) literature and its arrangement does not clearly distinguish the two. It includes versions of the Vinaya Pitaka, the first four nikayas, the Dhammapada, the Itivuttaka and the Milindapanha and of parts of some other books. These Chinese and Tibetan versions are not usually translations of the Pali and differ from it to varying extents, but are recognizably the "same" works. On the other hand, the Chinese abhidharma books are different works from the Pali Abhidhamma Pitaka, though they follow a common methodology. Looking at things from the other side, the bulk of the Chinese and Tibetan canons consists of Mahayana sutras and tantras, which, apart from a few tantras, have no equivalent in the Pali Canon. Tipiṭaka (Pali Canon) of the Theravada school. The Āgamas contain the Majjhima Nikāya and Saṃyutta Nikāya of the Sārvāstivāda. The Āgamas contain the Dīgha Nikāya of the Dharmaguptaka. The Āgamas contain the Aṅguttara Nikāya (Ekottara Āgama of the Mahāsaṅghika. The Vinaya Piṭakas of Sārvāstivāda, Mahāsaṅghika, Dharmaguptaka, Mahīśāsaka. The Mūlasārvāstivādin Vinaya Piṭaka is preserved in the Tibetan Buddhist tradition, along with Mahāyāna sūtras and tantras. The Gandharan Buddhist texts contains some books and fragments of the Tipiṭaka of (probably) the Dharmaguptaka school. ↑ Encyclopedia of Religion. (New York: Macmillan, sv "Councils, Buddhist". ↑ A. K. Warder. Indian Buddhism, 3rd ed., 307; American Asiatic Association, Asia Society, Asia: Journal of the American Asiatic Association, 724. ↑ Peter Harvey. Introduction to Buddhism: Teachings, History and Practices. (Introduction to Religion) (Cambridge University Press, 1990. ISBN 0521313333. ), 3. ↑ The English translation by the Pali Text Society is not yet complete;  although most of it has been translated. ↑ This can be verified by inspecting the table of contents of the VRI transcription. ↑ Dharma Society Fund: Mahāsaṅgīti Tipiṭaka Buddhavasse 2500. ↑ Journal of the Pali Text Society vol. XXVIII, (2006): 61f. ↑ The World of Buddhism, ed. Bechert and Gombrich. (London: Thames and Hudson, 1984), 78. ↑ Hajime Nakamura. Indian Buddhism. (Japan: 1980) (reissued Delhi: Motilal Banarsidass, 1987, 1989), 27. ↑ Cousins, "Pali oral literature," in Buddhist Studies, ed. Denwood and Piatigorski, (London: Curzon Press, 1982/3); Harvey, 83; Gethin, 48; The Guide. (Pali Text Society), xxvii. ↑ Journal of the International Association of Buddhist Studies 28 (part 2): 302. ↑ Hinüber, Handbook of Pali Literature. (Berlin: Walter de Gruyter, 1996), 5. ↑ Most notably, a version of the Atanatiya Sutta (from the Digha Nikaya) is included in the tantra (Mikkyo, rgyud) divisions of the Taisho and of the Cone, Derge, Lhasa, Lithang, Narthang and Peking (Qianlong) editions of the Kangyur: Skilling, Mahasutras, volume I, Parts I & II, (Pali Text Society, Lancaster, 1997), 84n, 553ff, 617ff. all links Retrieved July 15, 2009. Bodhi, Bhikkhu, ed. In the Buddha's Words: An Anthology of Discourses from the Pali Canon (Teachings of the Buddha). Wisdom Publications, 2005. ISBN 978-0861714919. Cone, Margaret. A dictionary of Pali. Pali Text Society, 2001. ISBN 086013394X. Dhamma, Rewata. The Buddha and His Disciples. Birmingham, (UK): Dhamma-Talaka Pubns, 2001. Ganeri, Anita. The Tipitaka and Buddhism. (Sacred Texts) Mankato, MN: Smart Apple Media, 2003. ISBN 978-1583402467. Gethin, Foundations of Buddhism. Oxford University Press, 1998. Gombrich, Richard, (Author), Ed., Heinz Bechert, Ed., The World of Buddhism. (The Great Civilizations) with contribution by Etienne Lamotte. Thames & Hudson, 1991. ISBN 0500276285. Gombrich, R. Theravada Buddhism: A Social History from Ancient Benares to Modern Colombo. Routledge, 1988. ISBN 0415075858. Harvey, Peter. An Introduction to Buddhism: Teachings, History and Practices. (Introduction to Religion) Cambridge University Press, 1990. ISBN 0521313333. Hinüber, Oskar von. Handbook of Pali Literature. (Indian Philology and South Asian Studies, 2nd ed.) Berlin: Walter de Gruyter, (1996) 2000. ISBN 3110167387. Lopez, Donald. Buddhist Scriptures. Penguin Classics; New Ed. 2004. ISBN 978-0140447583. Mendelson, E. M. Sangha and State in Burma: A Study of Monastic Sectarianism and Leadership. (Ithaca, NY: Cornell University Press, 1975. ISBN 978-0801408755. Mizuno, Kogen. Essentials of Buddhism: Basic Terminology and Concepts of Buddhist Philosophy and Practice. (original in Japanese, 1972) English version pub. Kosei, Tokyo, 1996. ISBN: 4333016835. Morgan, Kenneth W., ed. Path Of The Buddha: Buddhism Interpreted By Buddhists. (original 1956) reprint ed. Kessinger Pubs. 2006. ISBN 1425484654. Nakamura, Hajime. Indian Buddhism: A Survey With Bibliographical Notes. (Buddhist Tradition Series, Vol 1). (original Japan: 1980) reissued Delhi: Motilal Banarsidass, 1987, 1999. ISBN 978-8120802728. Potter, Karl H. (compiler). Bibliography of Indian Philosophies. (Encyclopedia of Indian Philosophies, Vol. 1) Delhi: Motilal Banarsidass. Schopen, Gregory. Bones, Stones, and Buddhist Monks: Collected Papers on the Archaeology, Epigraphy, and Texts of Monastic Buddhism in India. University of Hawaii, 1997. ISBN 0824817486. Skorupski, Tadeusz, and Ulrich Pagel. The Buddhist Forum. University of London. (School of Oriental and African Studies) RoutledgeCurzon, 1990. ISBN 0728601621. Warder, A. K. Indian Buddhism, 3rd ed., Delhi: Motilal Banarsidass, 2004. ISBN 978-8120808188. All links retrieved December 17, 2015. The Pali Tipitaka Project. (texts in 7 Asian languages) tipitaka.org. This page was last modified on 17 December 2015, at 16:19.